Locally, in August 2014, a London Free Press article indicated there were 138 documented hoarding cases just in London that year since January and 364 documented hoarding cases (again, just in London, Ontario) since 2009. Earlier this year, an NBC affiliate in Washington D.C. made a video about the fire safety risks posed by hoarding, after a dozen local fire deaths were attributed to hoarding since 2013. During the video, they time a typical search and rescue at around five minutes, while a search and rescue in hoarder conditions is closer to an hour and a half. Dr. Randy Frost, a psychology professor at Smith College who is an expert on hoarding, has defined compulsive hoarding disorder as: “the accumulation of, and failure to discard, a large amount of belongings that have little or no apparent value.” While the belongings may appear to be junk, from the hoarder’s perspective, they may be viewed as treasured collections with assigned emotional value, making them difficult to discard. These “collections” accumulate until windows and doors are blocked, and rooms and walkways are no longer usable. Frost estimates only a small percentage of compulsive hoarders live in squalid or unsanitary conditions. Cooking and heating become unsafe when there are piles of flammable items too close to the sources of heat. Heaters may tip over, or piles of collected items may tip over onto the stove top or heater without even being noticed, causing a fire. With collections of items piled high in rooms, it is often impossible to test and maintain working smoke alarms, or access basic fire safety devices such as fire extinguishers. Homes where hoarding occurs become a refuge for pests like rats and cockroaches. These pests (in addition to cats or other animals which may be present) often chew on wires, leaving them exposed and creating another fire safety risk. When utility bills are lost amid other belongings, they go unpaid until the electricity is finally turned off. Then hoarders resort to candles and gas burners, amplifying the potential for a devastating fire. In hoarder homes, belongings often block doors and windows. Blocked pathways and exits hinder escape routes in a fire. They also prevent firefighters from locating and removing occupants promptly. Firefighters are often injured and trapped by falling objects in hoarder occupancies. Homes where hoarding occurs put neighbors in the same building and residents of nearby structures at an elevated risk of fire. For example, in 2010, a 712-unit apartment building in Toronto caught fire in a hoarder’s unit, injuring 17 and displacing over 1,200 people, many of whom were unable to return home for months. As fire officials inspected, they found 19 more units in hoarding conditions. And those are just the fire safety risks. There are also issues of mold, disease, and pests. In buildings with common walls, complaints of pests and smells may arise from neighbors of hoarders. A 2013 New York Times article talks about maggots, invading bacteria, and a woman cleaning up a hoarder’s house who tested positive (and was hospitalized) for the rodent-borne hantavirus. In this FireEngineering.com article, 40-year fire service veteran Bill Gustin describes the public health problem that occurs “when cockroaches and rats infest stacks and piles of contents and scurry out of their nests when disturbed by smoke or firefighters [looking for another nearby home].” Gustin also describes how firefighters must wrap duct tape around the cuffs of their coats and pants to avoid “one of the most unpleasant aspects of hoarder fires;” fleeing cockroaches crawling up pant legs and trying to stow away inside firefighters’ clothing. The way you approach and talk to someone you think is hoarding will largely determine your success. Remember that they may not consider themselves a hoarder, even if you do. What you think is junk, they probably don’t. Experts advise you match their choice of language (“collections,” “treasures,” “belongings,” rather than “junk,” “trash” or “hoarding,” etc.). Remember, these are things they are attached to, and their relatives have likely already tried unsuccessfully to get them to throw them out. They may feel defensive, embarrassed, violated, and overwhelmed, among other emotions. If you want to be heard, enlist the help of those experienced in dealing with hoarders and research effective communication techniques. The NFPA’s free guide on hoarding and the fire service (available here) recommends that you focus on safety issues and try to build support for addressing those specific, immediate issues rather than demanding a total cleanup. Orange County Fire Authority inspector Darren Johnson models what that looks like in his visit to a hoarder in this New York Times article. In Ontario, hoarding by itself is not typically enough to evict a tenant over (Canadian Apartment Magazine). However, when it becomes a public health or safety hazard, there may be grounds under the Residential Tenancies Act, 2006, to apply for an eviction order from the Ontario Landlord and Tenant Board. Tenants can also be evicted under a fire-protection law if there is an immediate threat to life (Toronto Sun). Because hoarding is a clinically-diagnosable psychological disability, a hoarding tenant may be protected by the Ontario Human Rights Code. According to Christopher Statham, a lawyer at Devry Smith Frank LLP, even in cases where the tenant’s hoarding poses a public health or safety hazard, if the tenant can demonstrate he or she suffers from a disability, they may still be able to continue to occupy their unit. Also, it is important to note that because the hoarding is a symptom of an underlying issue, even if the residence is cleaned up, without ongoing support to address the condition, the stockpiling and hoarding will simply re-occur. Carefully document all conversations, events, inspections, and complaints related to the hoarding. 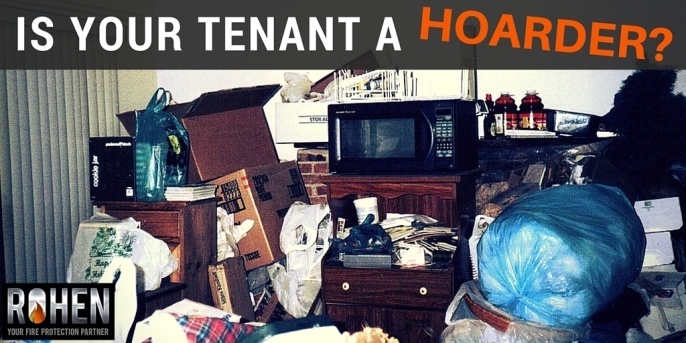 Speak with an attorney experienced in tenant hoarding issues in Ontario. The landlord (owner) of the unit can enter the unit for an inspection with sufficient notice as described in the Residential Tenancies Act. If the unit is not in sanitary and working order, with exits clear, in accordance with Municipal Standards and Public Health bylaws, the landlord can grant entry to the fire department for an investigation of fire hazards and Fire Code violations. You may also be interested in this infographic for property managers about hoarding from Appfolio Property Manager; view it here. 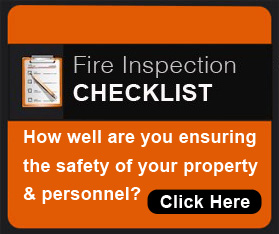 If you have questions about fire protection services for properties you own or manage, Rohen can help. Image credits: Shadwwulf at English Wikipedia [CC BY 3.0], via Wikimedia Commons; modified by resizing, filtering, cropping, and text overlay.